The church’s catchphrase “all are welcome” is so common it seems like a meme. But what do these three simple words actually mean? Are they sincere or do dwindling congregations just hope to get people in the pews? Is it just what we think we should say? 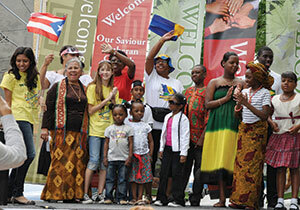 Our Saviour Lutheran Church, Jamaica, N.Y., hosts an annual carnival as a community outreach event. Food and activities are all free. The event helps people in the neighborhood learn about the church and meet members. Welcoming isn’t simple. 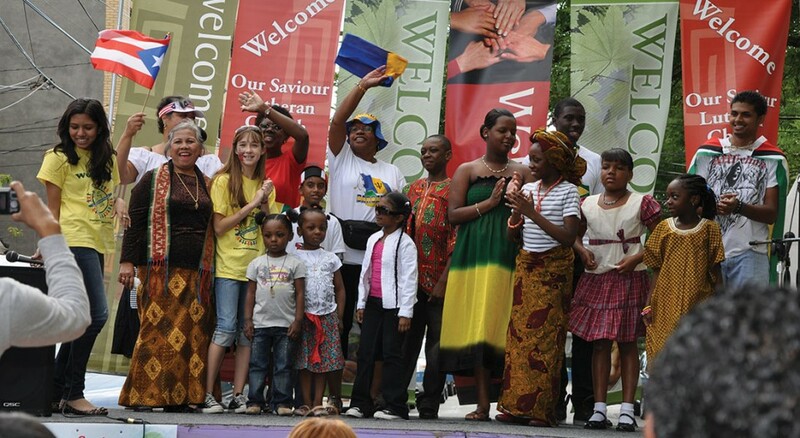 How churches welcome newcomers can often mean the difference between vibrant congregations and those that struggle. “‘All are welcome’ used to mean those who look like us, act like us, have the same lifestyles and same values,” said Brenda Smith, ELCA program director for faith practices and missional development. Smith, who served as a pastor in New York City before joining ELCA churchwide staff in Chicago, said the good news is that it’s 2016 and hospitality ministry is a faith practice. It also means that congregations need to be inclusive and understand that not everyone has grown up in the church, knows Jesus or can follow a worship service, she added. 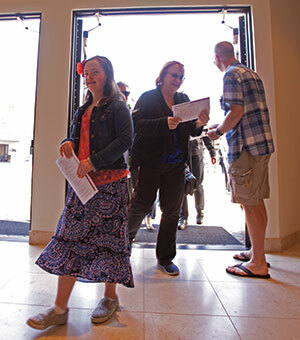 Katelyn Reed enters Messiah Lutheran Church, Yorba Linda, Calif., for worship after being welcomed by Rick Eckart, a greeter and usher. “I’ve been in many churches where I visit incognito and would never go back because there was no hospitality,” she said. “Or the church was dirty and not maintained or had no place to change a baby diaper.” Worse yet, Smith said, sometimes congregational tension and drama were palpable. “I often ask churches to think carefully about what environment they’re bringing people into,” she said. 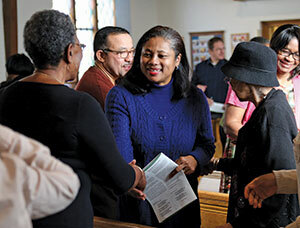 While the words “all are welcome” seem innocent enough, they evoked a wide range of responses when The Lutheran asked its friends and followers if their congregations welcomed folks and to share examples of how they felt welcomed or not. That request produced more than 50 Facebook posts and emails, and 270 likes and almost 90 shares on Facebook. Jennifer Pierre (in blue) shakes hands during Sunday worship at Our Saviour, which implemented a welcoming ministry that saved it from being closed. Responses also included criticisms from those who had been hurt by the church, or people who visited a congregation and felt ignored. Diane Pederson, a member of St. Timothy Lutheran, Naperville, Ill., still remembers how badly she felt after visiting a small Lutheran church with her family while vacationing in Florida 10 years ago: “The service was warm and lovely. But afterward, during the fellowship time in the small narthex, the 50 or so congregants happily greeted each other as we stood among them, ignored. We felt invisible. “We never returned to that church because we never vacationed in that area again. But if we were snowbirds, we would’ve sought out a different church. As someone uncomfortable with small-talk chitchat with strangers, the feeling of invisibility was very strong for me. My more social husband felt it too. 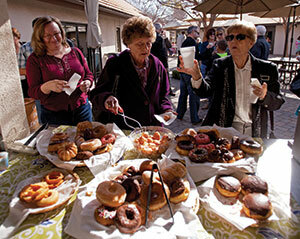 Christine Curl (left), Irma Mulder and Faye Phillips partake in treats and coffee during “Sunday morning hospitality” at Messiah, which views food as a universal language and offers coffee and doughnuts every week. Some churches have no coffee hour because they view it as too overwhelming for visitors. “Welcoming” is a complicated and emotional challenge that isn’t problematic only to the ELCA, said the church’s pastors who were interviewed for this story. They define a welcoming ministry as being inclusive and mindful of a congregation’s identity, recognizing members’ gifts and understanding what they are comfortable with, acknowledging the neighborhood, and assessing the needs of those to be welcomed. Pastors said there’s no one-size-fits-all approach to welcoming — one person’s welcome is another person’s wall. Congregations, Smith said, would be smart to embrace the cultural norms of 2016, including the needs of young people and the lesbian, gay, bisexual and transgender (LGBT) community, the use of technology, people’s busy schedules and the fact that the church isn’t the center of life anymore. People often “church shop” and make judgments based on what they initially see and feel. Jim Harter, with Carmen Pease, holds up the sign for the new welcome center at Messiah. For shy or introverted people, an overly friendly greeting or coffee hour can be off-putting or cliquish. An extended sharing of the peace — where members walk around the sanctuary hugging people and chitchatting — might appear friendly to some newcomers and uncomfortable to others. 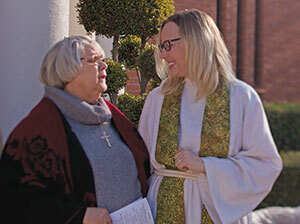 Kathi Shaheen (left) and Cheryl Hoffman greet one another during worship. This is formally called “passing of the peace,” but Messiah asks people to greet those around them in an effort to use language that is friendly to guests. 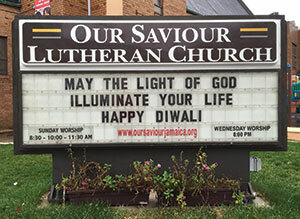 Craig Mueller, a pastor of Holy Trinity Lutheran, an urban Chicago church, is sensitive to the needs of newcomers and runs what he calls a general welcoming program, inclusive of both introvert and extrovert personalities and communication styles. Holy Trinity has a long history of welcoming the LGBT community. Mueller said that (along with other factors) has helped create a welcoming and healthy church atmosphere. This can be a problem for small Protestant congregations where members act like family, Mueller said. But this is the technology era, he added, where young people are used to communicating behind a screen, texting or emailing. It’s OK, he added, to not know everyone in the congregation and to not greet them by name. 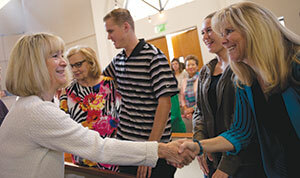 Angela Denker, a pastor of Messiah, greets Sue Lindemulder after worship. Denker says welcoming is about churches looking for their gifts and picking a niche. Mueller, whose doctoral thesis was on technology and the decline in mainline denominations for the future, is often asked how his congregation manages to be welcoming to all. “The main thing that I’ve helped churches think about is to get over the family mentality — that everyone comes to be a family,” he said. “Some people like anonymity. In Jamaica, N.Y., the situation was fairly dire when Bob Fritch arrived at Our Saviour Lutheran Church 24 years ago. The congregation’s New York City neighborhood was evolving into a Caribbean-rim community, and Fritch said he was faced with changing how to do church or closing. The pastor began practicing a welcoming ministry that revitalized Our Saviour. “We were a church slated to be closed, so a welcoming program does work,” he said. Today Our Saviour is home to 250 worshipers at three Sunday services and is a congregation that is constantly changing in a transient neighborhood. Fritch said his approach focused on going back to basics: “First, fix your signage, clean the bathrooms, and make sure that people can follow your worship service and it isn’t confusing. “We’ve forgotten what we’re called to do — we’re not here to keep the clubhouse open. We’re called to bring God’s word, and we must do it in new and different ways. A church’s first welcome, Fritch said, is its website. He suggested making it clear and inviting since people will often Google search a church before visiting. “The website gets people into the front door even before they ever walk in,” he said, “so show photos of happy people and not just shots of the building. When this fragmentation happens, she added, no one’s interests are well served. Too often, all aren’t welcome after all. We create hoops for newcomers to jump through and unwritten rules, and people won’t explain the unwritten rules. All are welcome, including bullies. Sometimes the church doesn’t do a good enough job of exercising church discipline for those who need it. All are welcome and no one’s needs are met. We try to be everything to everyone. Everyone wants to be the church with lots of children’s programs, or the congregation with diversity, or one that helps the homeless. Pick a niche and stick with it. Most every congregation desires to grow with new members who will bring new energy, ideas, enthusiasm and resources. And although most every congregation wants to be a welcoming place for everybody, some unintentionally and unconsciously send mixed signals that keep some folks away. But this is something a congregation can work on.